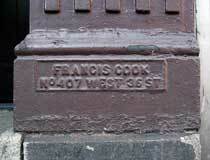 In 1900 Francis Cook was 70 years old and lived at 153 W. 62nd St., Manhattan. The U. S. Census of that year recorded his occupation as "Architectural Iron Works." At this time Cook was approaching the end of his career in iron work. Ten years later in the 1910 census he still lived at 153 W. 62nd St. but recorded his occupation as "retired." This advertisement for the J. & F. Cook Iron Works appeared in the Real Estate Record and Builder's Guide, vol. 5, no. 105, 19 March 1870, p. 2. The address was no. 122 W. 35th St., "Near Broadway" - i.e., where Macy's Dept. Store has been since 1902. Around 1860 the firm, Joseph Cook & Brothers, was formed, consisting of the three brothers(? ), Joseph, Francis, and Valentine Cook. From 1865 to 1871, with the departure of Valentine Cook, Joseph and Francis M. Cook remained in business together. After 1871 there is no further trace of Joseph Cook, and Francis Cook was in business by himself. F. Cook Iron Works spanned 1871 to 1906, although J. 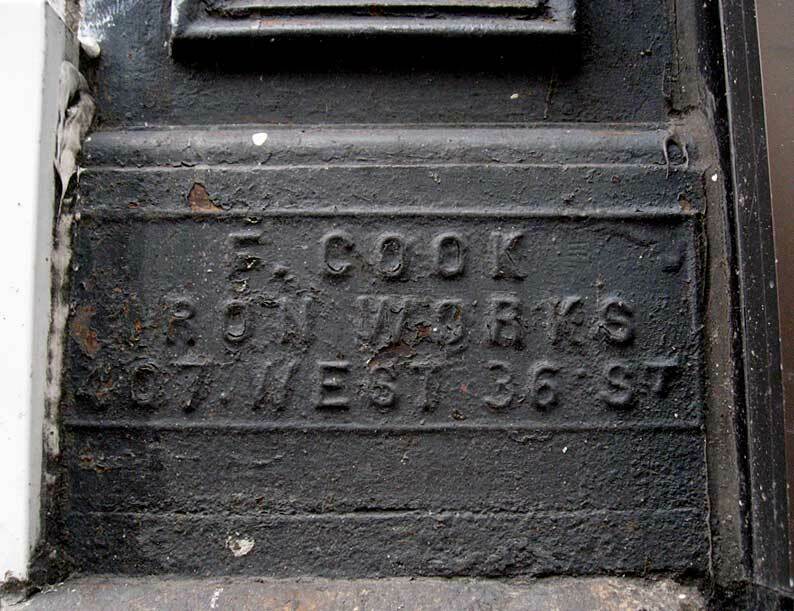 & F. Cook Iron Works seems to have been the firm name for part of this period. The 1880 U. S. Census recorded Francis Cook, Iron Railings. The company owned $5500 capital and $21,500 in materials. They employed an average of 16 laborers and paid $8550 total wages in the year. They operated full time 9 months in the year and 3/4 time the other 3 months. Their production for the year June 1879 through May 1880 was valued at $35,500. 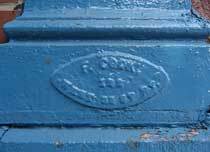 Francis Cook also manufactured coal chute covers. An example is shown on the Francis Cook manholes page.